Yes, as a matter of fact, I am writing this blog post just to tell you about my new favorite breakfast. Well, for this week anyway. I was getting kind of sick of eggs, cold yogurt bowls, & cold cereal so on Monday I tried something a little different. I loved it so much I did it again on Tuesday, Wednesday & today. As luck would have it, it’s dreary & cool this morning so my new favorite warm breakfast was the ultimate comfort breakfast. It’s not hot so it’s okay for warm days. It’s not cold so it’s okay for cooler days. It’s freakin’ tasty so it’s perfect for any day. The Greek yogurt brings the temp down a bit but not so much that the peanut butter doesn’t get velvetty smooth mixed in. And not so much that the chocolate chips don’t sorta melt as you’re eating it. 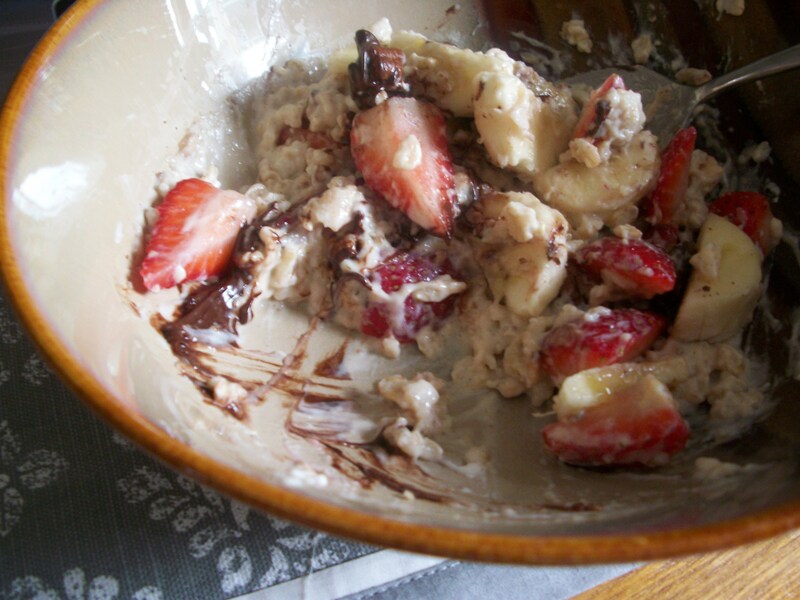 You get little chocolately streaks on your bowl as you eat, like this. And those chocolately streaks make me smile because it’s kinda like you’re eating dessert, even though you’re really eating a well-balanced breakfast. Heart healthy oatmeal, protein-packed Greek yogurt & peanut butter, fresh fruit, better-for-you dark chocolate, & cinnamon, which I’m pretty sure I read is good for you too, right?? I don’t care. It’s yummy in my tummy. 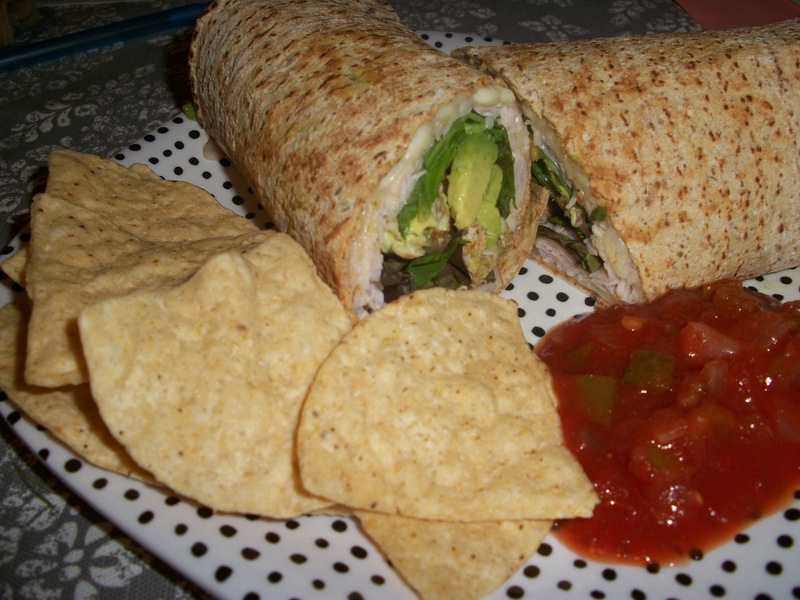 One multi-grain Flat Out Wrap, warmed on a pan until a slice of pepperjack cheese gets nice & melty. Then I top the cheese with deli turkey, lettuce & chopped avocado. Served with a little side of chips & salsa (& plain Greek yogurt sometimes). I’m usually not a big meal repeater but it’s been a busy week & I’m loving my repeats. I have a super busy day ahead of me but the gloomy weather makes my couch SO inviting. There’s a chill in the air so thankfully my busy day involves plenty of baking to keep the house nice & toasty! You might hear from me later this afternoon with a Thirsty Thursday post but if not, happy almost weekend to you!! Are you a meal repeater or do you change things up daily? I usually get bored if I eat the same thing day after day, but for whatever reason, I’m not sick of my eats yet this week! In fact, I had just a half of that wrap on Tuesday so I could save the other half for another day! I do go in spurts where I’ll eat the same thing over & over again until I get sick of it (like hummus) but this is the first time I’ve eaten not one but two meals each day that are exactly the same for a few days in a row. I guess maybe I’m finally getting better about “using what I have” rather than going out & buying new when a craving strikes. Plus, my at-work meal is probably keeping me satisfied as far as change is concerned. Yum..that wrap looks amazing. I have been eating tons of avocados since I got bk to the States….your breakfast looks good too. I tend to eat similar things until I get burned out on them, then I switch. I LOVE flat out wraps. 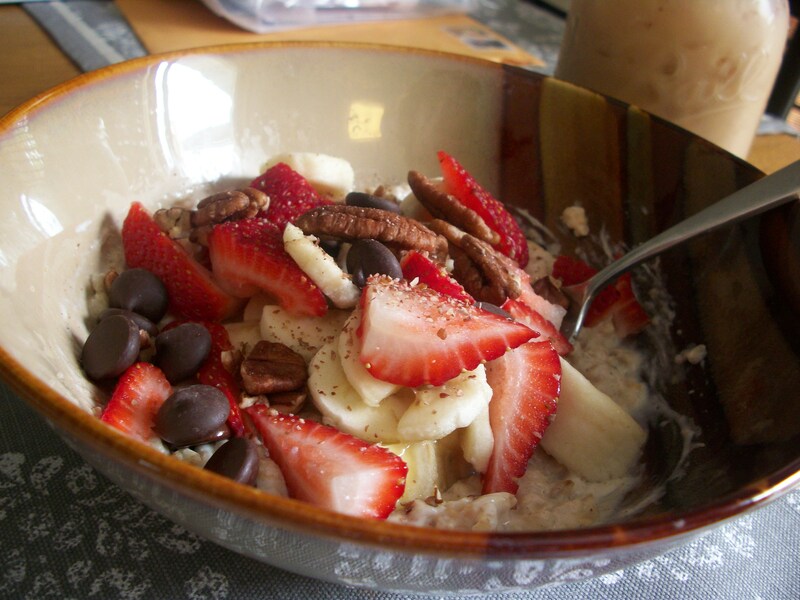 Those pecans look awesome in oats!